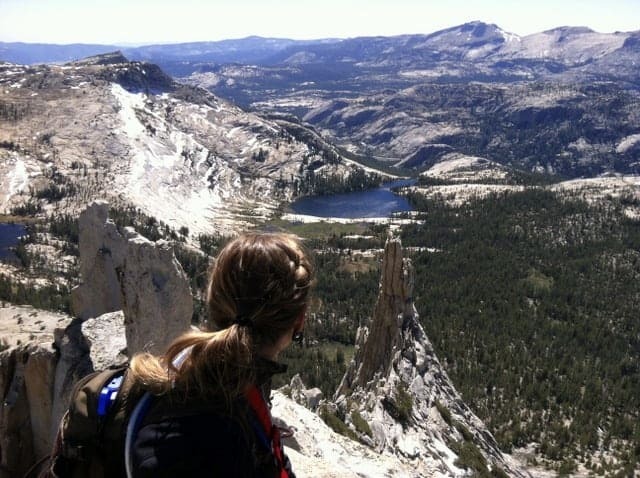 For this Adventure of the Week, TMS blog editor Julie Brown writes about climbing Cathedral Peak in Tuolumne Meadows. 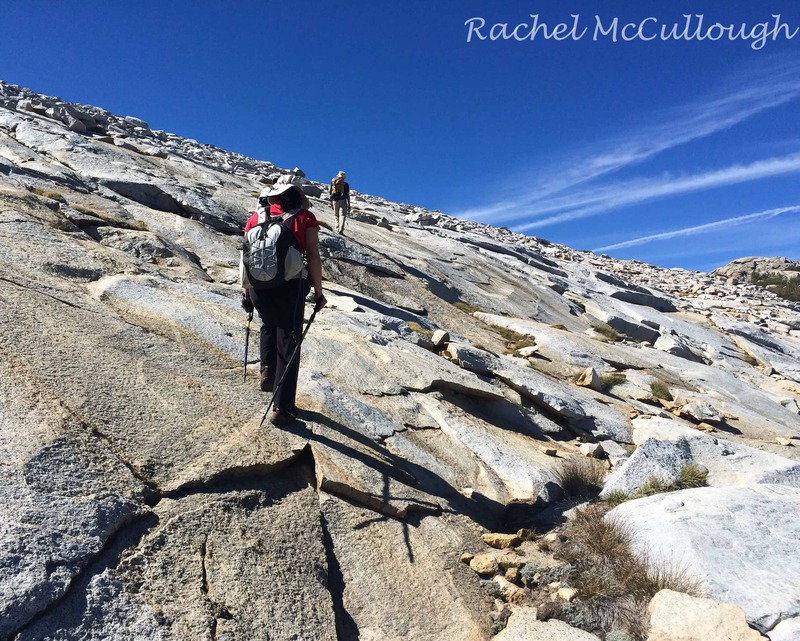 She wasn’t alone on the rock like John Muir, but the climb is still a classic. 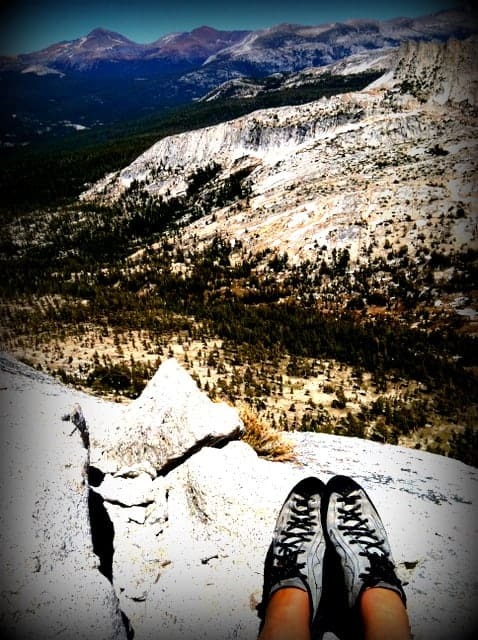 Standing on the summit of Cathedral Peak in Tuolumne Meadows, a granite world expanding beyond the horizon, you understand John Muir’s praise of this aesthetic mountain. 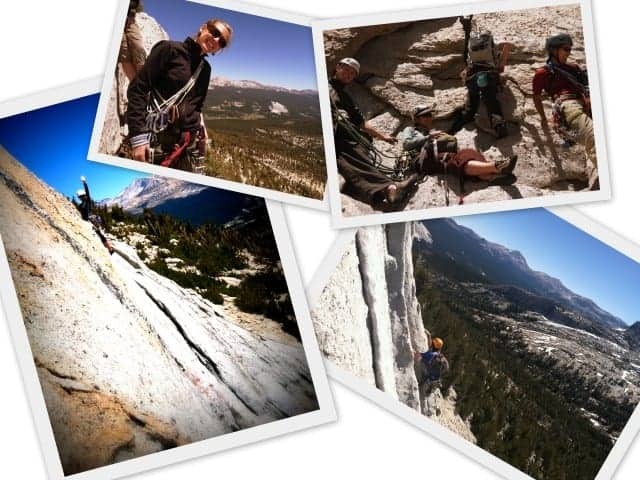 Muir made the first ascent of Cathedral Peak in 1869; 143 years later, I summited Cathedral. While I envied the solitude Muir experienced on this classic climb, I still lost myself in the moment when I reached the 10,911-foot summit. 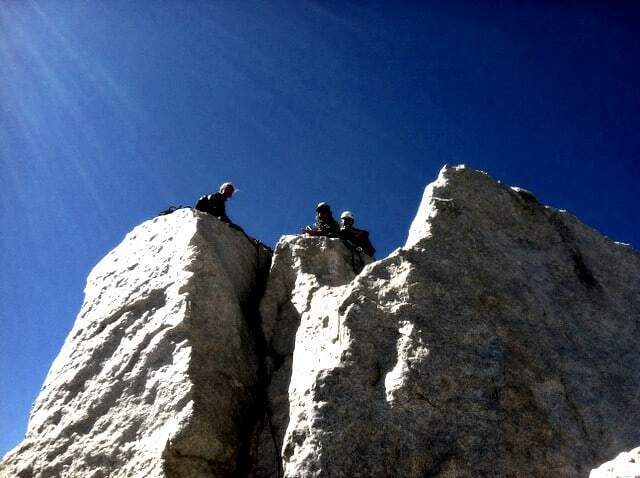 I went after the summit of Cathedral Peak with seven other friends from Tahoe. It took a little initiative and everyone was on board. Since a few of us are weekend warriors, we decided to climb Cathedral on a Saturday — for better or worse. No one is exaggerating when they say this is one of the most crowded climbs in Tuolumne. Like everyone else on the rock that Saturday, we were attracted to Cathedral by both its reputation as a classic Tuolumne trad climb and its moderate rating. And even though we set the alarm for 5:30 a.m. (and finally crawled out of our sleeping bags at 10 to 6), we were far away from the first group to reach the base of the Southeast Buttress. Still, warmed up from the approach hike, we weren’t discouraged and set out on the first pitch of the day. The climbing on the Southeast Buttress starts out pretty mellow and then steepens towards the top — although it’s all very accessible at a 5.6 rating. It’s easy to pass parties in the first couple of pitches, but everything bottlenecks about halfway up at the Chimney, a really fun feature where you squeeze between two faces and stem up to the opening above. I squeezed in between two other parties waiting to climb the Chimney and set up my anchor, where we proceeded to chill for the next hour waiting for everyone to climb up. I suggested avoiding the Chimney and climbing around, but my climbing partner Ashli said this was the best move of the entire Southeast Buttress, so we stayed, ate lunch and literally hung out. Not a bad view to look at for an hour, though. Finally, it was our turn, and the climbing resumed. Up a few hand cracks, finagling 5.7 knobby jugs, teetering around an exposed block, and then up the final ten feet to the summit — a block big enough for a handful of people featuring one of the most serene views of my life. The Sierras unfold in every direction — lakes and granite forever. And for the first time that day, the Eichorn Pinnacle came into view behind the summit, beckoning me to its summit next. I now know what a “5.4 wild” rating means. 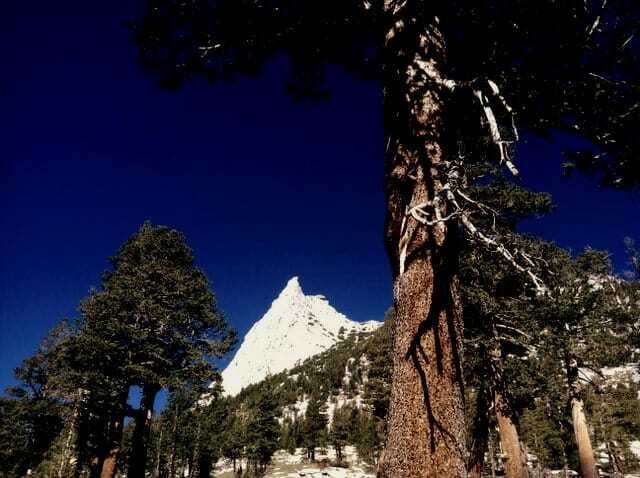 The Eichorn Pinnacle is perhaps the most exposed and thrilling easy climb ever. We had to climb it. We traversed out on a ledge and rounded the corner where the ground literally drops out from underneath your feet. The only way to go is up. And luckily the moves are solid enough to keep your head (sorta) cool. 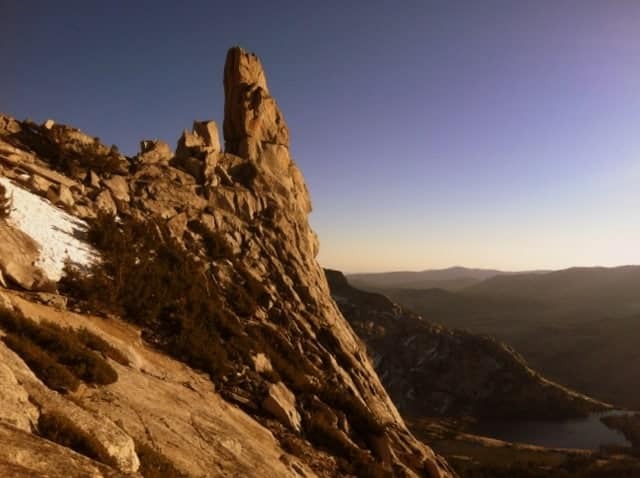 The top of the Eichorn Pinnacle is even more exposed and breathtaking than Cathedral. 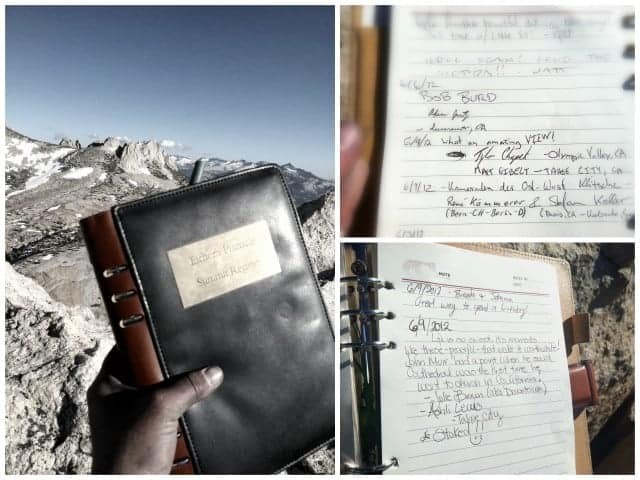 And unlike the summit of Cathedral, Eichorn has a summit register, which was placed in memory of Christina Chan and holds the signatures of countless climbers. I wasn’t alone up there. But climbing Cathedral Peak is still magnificent and wild. And it’s definitely a classic in my book.